Well, the first six months of 2016 flew right by! 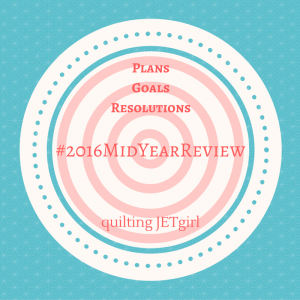 Did you see Yvonne at Quilting Jetgirl is hosting a 2016 Mid Year Review link party? 2. 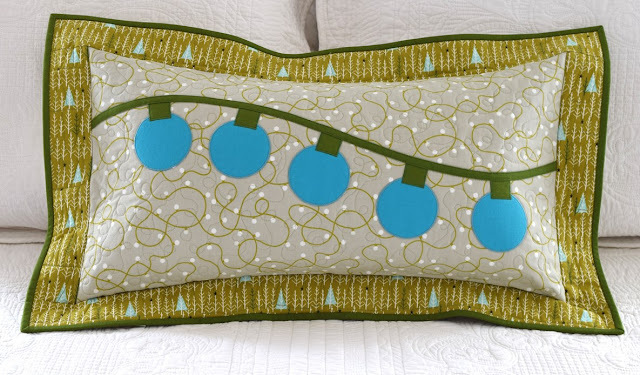 Write a tutorial - I participated in 12 Days of Christmas in July Blog Hop hosted by Sarah at Confessions of a Fabric Addict and presented Blue Christmas, a machine applique pillow cover or wall hanging tutorial. Perfect timing...I checked this one off my list just yesterday. 3. 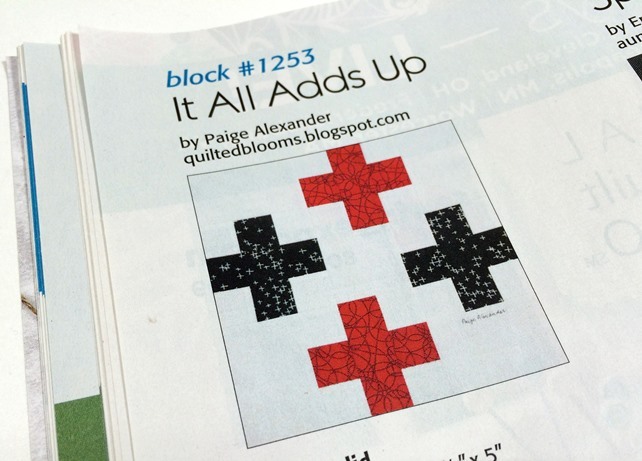 Participate in the 2016 New Quilt Bloggers Blog Hop - I've met so many new bloggers thanks to hosts Yvonne at Quilting Jetgirl, Cheryl at Meadow Mist Designs and Stephanie at Late Night Quilter. 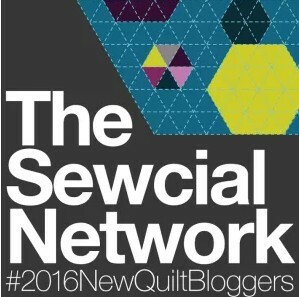 My introductory post was the 2nd week of June and was I was part of the The Sewcial Network. 4. Brand Identity - I wanted a logo which included a button from a card of vintage pearl buttons from my grandmother and Valerie from Inkblot Graphic Design Studio designed my blog header and other graphics just as I had envisioned. I also worked with Emily at BD Web Studio who updated my blogger template and created a gallery separated between finished quilts, projects and quilt blocks which are listed by year. Now, I need a new tab for tutorials! 1. Quilt of Valor - I am planning a quilt in non-traditional patriotic colors following the Star Light, Star Dark Quilt-A-Long by Jess at Quilty Habit. These are my fabrics. More about this later. 2. Charity Quilt - no progress on this one. 3. Midnight Mystery Quilt - I posted back in January one complete block here. 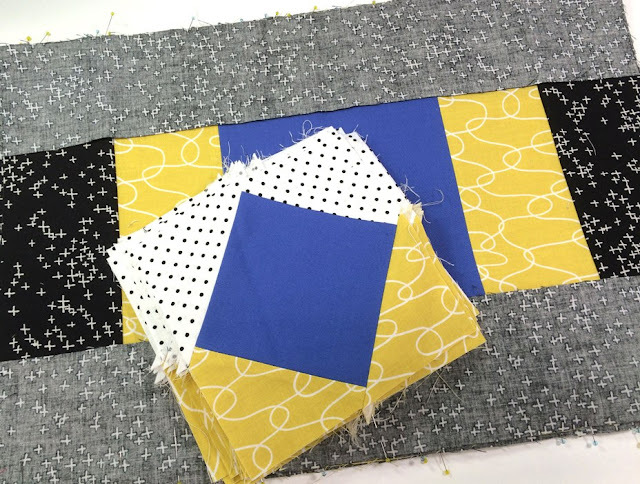 Unfortunately, no progress on this one lately and now Cheryl's new mystery quilt, Meadow Mystery, is just getting under way with fabric selections going on now. I had the opportunity to review the Meadow Mystery and it's a beauty! 4. Modern Quilts Unlimited Block and Quilt Challenge - All 12 blocks are completed in the Everything Old is New Again Challenge and now and it's time to decide on a layout for the final quilt. The deadline is Sept 15th. My post about Block #12 gives more details about the blocks and challenge. Here are my 12 blocks. 5. Write and publish a pattern - No visible progress yet, but I'm thinking about this one. Oh wait, I did have a block, It All Adds Up, published in Quiltmaker's 100 Blocks, Vol. 13 in May. 6. 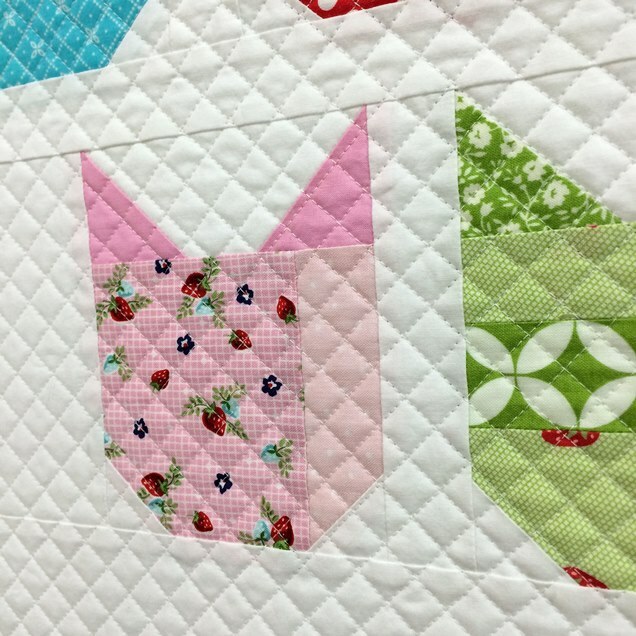 Online quilt or block swap - I've actually participated in 3 swaps this year. Rainbow Mini Swap Round 2: I made Colorful Cats pillow cover from Elizabeth Hartman's Cat Block pattern. I received this beauty from Becky @SolarThreads in exchange. Bonnie and Camille Low Volume Plus Swap - I made 30 plus blocks as you can see in my flipgram here and received 30 blocks in exchange. Sewtopia Swap - I made Becca Bags zippered pouches for a Sewtopia Swap and received these goodies in exchange. The year is shaping up and I'm looking forward to see what's in store for the remainder of 2016. I better get busy...now, hop on over to see everyone's progress at the 2016 Mid Year Review. Because I'm crushing on my progress, I'm linking to Main Crush Monday with Beth at Cooking Up Quilts. Wow, Paige, you have accomplished most of your goals in the first 6 months, that is really awesome! Thank you for linking up again, and I look forward to seeing what other great things you accomplish through the rest of the year. I'm really impressed with how much progress you have made on your goals..no wonder you are crushing on your goal list. Who knows what the rest of the year will bring. Lots of fun projects! Here's to many more! You have accomplished so much in the last six months, Paige. I am so glad to see that you are taking part in the new blogger blog hop. You are certainly an active blogger and a motivated stitcher! Wow - you had a very productive start to the year. Congrats on all your accomplisments! Great accomplishments, you are having a super productive year!! Well done on moving through your list of goals so quickly! I took the Craftsy class on Digital Photography Basics and I loved it! You're making very good progress on your goals. I should take a Craftsy photography class too. It's such a smart goal since photos really make a difference in blog posts. If you're interested in being an affiliate, so you'll earn commissions for your links, I have an affiliate link to that Craftsy page if you want to check it out: http://www.shareasale.com/shareasale.cfm?merchantID=29190&SSAID=875908. I love your logo; a logo redesign is another think I should consider. Thanks for the recommendation to your graphic designer. My interest is piqued by your non-traditional patriotic colors. What a fun idea! 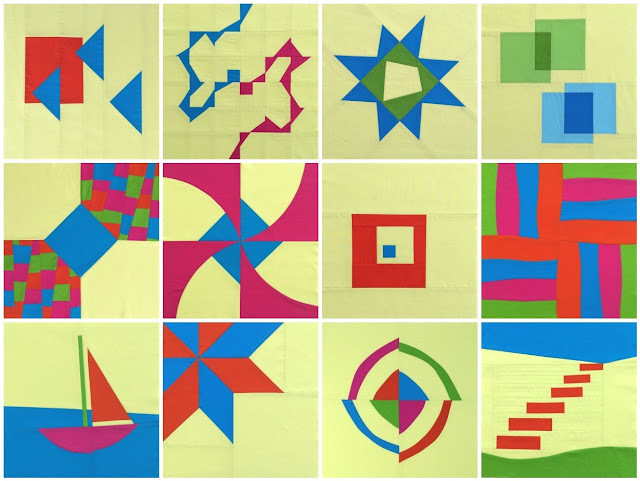 I'm impressed that you've done so well keeping up with the MQU Challenge, and look forward to seeing the c completed quilt. You have been one busy little bee, working on your goal list. Looks like you are making lots of progress. I've always thought you have fantastic photos. Good luck with the second half of the year. 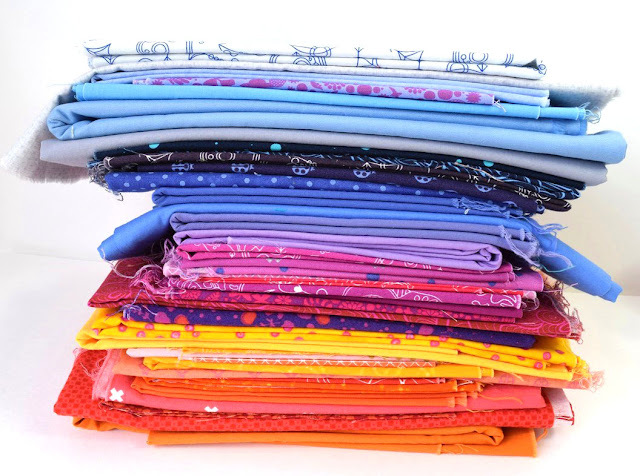 Your fabrics for the SLSD QAL are absolutely amazing! I can't wait to see/hear more!! Congrats on meeting so many of your goals. You must stay very organized! Paige, it was such a pleasure to get to know you during the 2016 New Bloggers Blog Hop and I really do enjoy reading your blog. You're one productive and talented lady! I think I already told you this but I just love your logo inspired by those buttons from your grandmother. That is really special. Paige, isn't it amazing to look back (and the year is only half way there) to see what you have accomplished? Well done :-) What a productive six months you have had. Wow, if that was your list for the year you've just about finished it in six months. Great going Paige, well done. I look forward to watching your progress over the rest of the year. Amazing to look back at all you've accomplished during the first half of the year. Congratulations! Amazing progress Paige! Your photography, blog, and quilts look great, looking forward to seeing more! Paige, the first half of your year has been downright amazing! Way to go! The fabrics you've combined in your Star Light quilt make me want to swoon. Just a gorgeous combination of color! For a new blogger, you certainly have the professional appearance and attitude to get somewhere, and clearly by the number of comments and accolades you refer to here, you are WELL on your way. Woo hoo!